Maggie Shea, CPA — StaffBuffalo - where buffalo works. When you first start working with Maggie, it does not take long to realize that she has one goal in mind, to make people happy. She embodies this goal every day, by matchmaking companies to future employees, in order to help businesses obtain and retain the right talent for their companies. This passion for helping people transformed into her ability to make a large impact on the recruiting industry in Buffalo since 2011. Maggie enjoys seeing her clients’ businesses grow and Buffalo, as a whole, continue to thrive. Maggie first found herself attracted to the Human Resource and Recruiting field while living in Boston and working for a Regional Accounting & Finance Recruiting Firm, custom building resumes, and working to help expedite the full-cycle Recruitment Process. Upon graduating from Northeastern University with a Bachelor’s Degree in Accounting and a minor in Mathematics, Maggie completed three years in Big 4 Public Accounting and large regional Public Accounting firms. She then transitioned careers to Human Resources and Recruiting to pursue her true passion of working with people and building relationships within Buffalo’s professional community. Maggie was able to hone in on her high-level Recruiting skills and managed a team of recruiters, quickly building a reputation for excellence within the Western New York Recruitment circle. Maggie has in-depth knowledge of the Western New York marketplace and works diligently to find the best-of-the-best in the competitive “passive” candidate market, which leads to quick turnaround for tough to fill positions. Maggie’s specialty focuses on finding the right fit for companies looking for high-level candidates to complete their teams. Maggie runs the Operations, Accounting, and General Management of StaffBuffalo. She encourages a culture of community involvement and volunteerism, which means shutting down the office at times to participate in volunteer activities, as a StaffBuffalo team. Maggie loves to use her skills to benefit others and does so through her roles on numerous Not-For-Profit boards, professional speaking engagements, and college career mentorship events. Maggie was one of the 2017 and 2019 Mentors for Business First’s Women’s “Mentoring Monday”, received the 2016 Big Brothers Big Sisters of Erie County “Women Who Move the City” Award, Buffalo Business First 2018 40 Under 40 Winner, and was recognized by The Buffalo News in the 2019 Prospectus as a Next Generation Leader for Professional Services. She also has helped start two professional organizations in Buffalo (#DisruptHR Buffalo and WNY HR YPs) and was a speaker at various professional events, including the keynote speaker at the Clarence Rotary Shadow Day, Amherst Chamber of Commerce’s “Six in Sixty: Speed Learning for Small Businesses”, “Community Involvement” for Leadership Buffalo, and Emerging Business Leaders (EBL)’s “Coffee Connections”. Maggie is the Communications Chair and former Treasurer for the Buffalo Niagara Human Resources Association (BNHRA), Treasurer for InfoTech WNY, President & Communications/Technology Chair and former Meetings Chair for the Accounting & Financial Women's Alliance (AWFA), and sits on the Membership Committee at The Saturn Club. Maggie is part of Child & Family Services' Ambassador Committee and was a Co-Chair for the Agency's largest fundraiser, Heartlight. In the near past, Maggie sat on the Emerging Business Leaders (EBL) Board and was the Treasurer and Website Director for the Parkside Community Association (PCA). Maggie also donates her hair bi-annually to Locks of Love or Children With Hair Loss. In her spare time, Maggie loves renovating her home from the 1890s, enjoying her North Buffalo neighborhood, and playing with her Black Russian Terrier (a HUGE dog resembling a small black bear - Sasha). 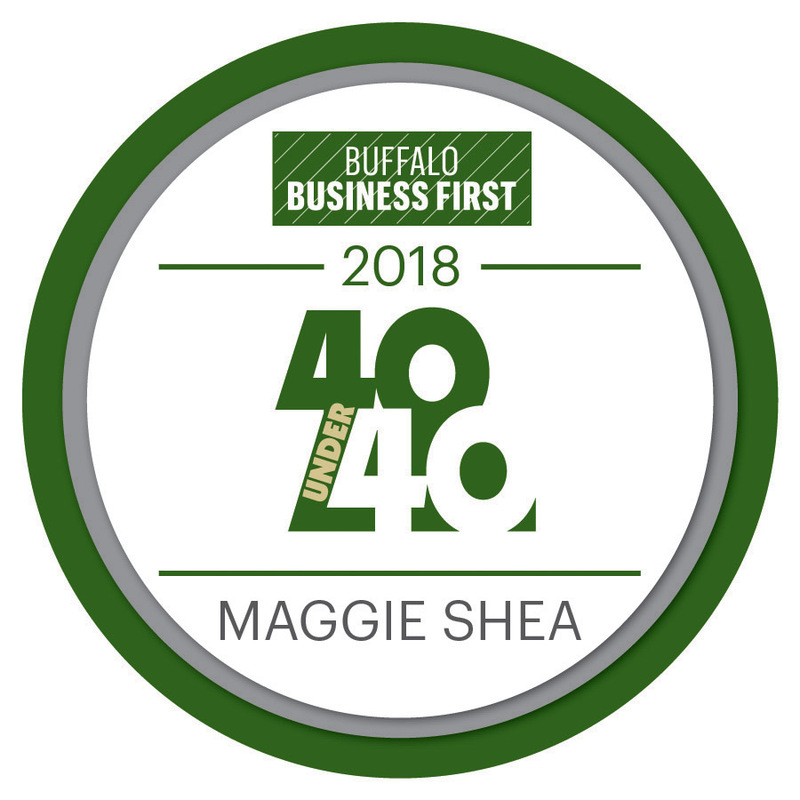 Maggie has fantastic leadership skills, and continues to motivate professional business men and women in the Buffalo community. Her success story is a true inspiration, and proves that hard work, dedication, perseverance, and passion truly matter.